PRODUCT DESCRIPTION: This lined adjustable night splint is designed for the treatment of Plantar Fasciitis and Achilles Tendinitis. 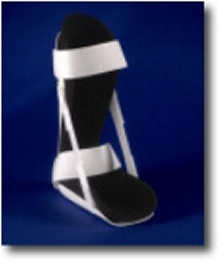 The orthosis features variable dorsiflexion assist straps limiting nocturnal contractures of the Plantar Fascia and Achilles Tendon. For additional Fascia stretch, a foam wedge is provided. Designed with the comfort of the chronic patient in mind, the splint incorporates foam padding and patient friendly elastic strapping. The neutral design fits either foot and reduces inventory needs.